Request 1 or more shape here. 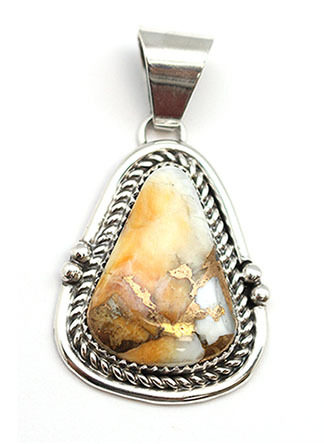 This sterling silver pendant is made with a free form, tear drop shape compressed spiny oyster with bronze matrix stone. It has a twist and plain wire border. It measures approximately 1 7/8" long including bail by 1" wide. It is Navajo hand made by Harry Spencer. Stone size and color shade will vary. Also "one" available in oval shape all others are more in the tear drop shape. Choose shape preference when ordering.